Military experts predict a formal indictment within the week - but what charges will be filed? The IDF soldier who controversially shot dead a neutralized soldier in Hevron last month will remain confined to his base, the military prosecution and the soldier's legal team announced Wednesday evening - with a formal indictment expected for next week. The Yafo (Jaffa) Military Court will formalize the "base arrest" agreement Thursday, following the soldier's release from full detention earlier this week. Earlier Wednesday, the military court on the Kirya army base in Tel Aviv rejected a remand request for the soldier. Controversy surrounds the case of the Kfir Brigade soldier, who shot a terrorist dead in Hevron two weeks ago after arriving at the scene of an attack; the terrorist had already been neutralized. 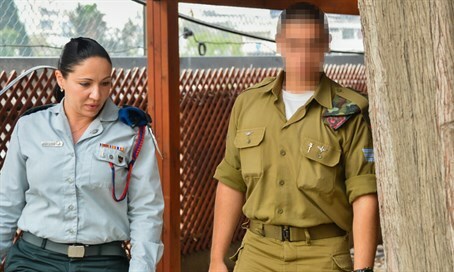 The soldier maintains that he believed that the terrorist was wearing a suicide belt, which was covered up by an unseasonable coat; the army prosecution, along with leftist activists from B'Tselem and other organizations argue otherwise. The case sparked a fierce debate, both legally and in the media, about the limits of self-defense during the current terror wave. Military experts predict Wednesday night that a formal indictment against the soldier will be filed next week - but uncertainty remains over the nature of the charges. Last week, the Qastina military court dropped "murder" charges, instead charging the soldier with "manslaughter"; recent IDF and MDA testimony may provoke further revisions.